Do Safer Cars Make NASCAR Drivers Behave More Recklessly? In 1975, Dr. Sam Peltzman hypothesized that more automobile safety regulations lead to offsetting behavior by participants; that is, as drivers gain comfort through safety enhancements, they drive more recklessly. This phenomenon is known as the Peltzman Effect, and with the Daytona 500 just a few days away, it's certainly relevant to race fans. 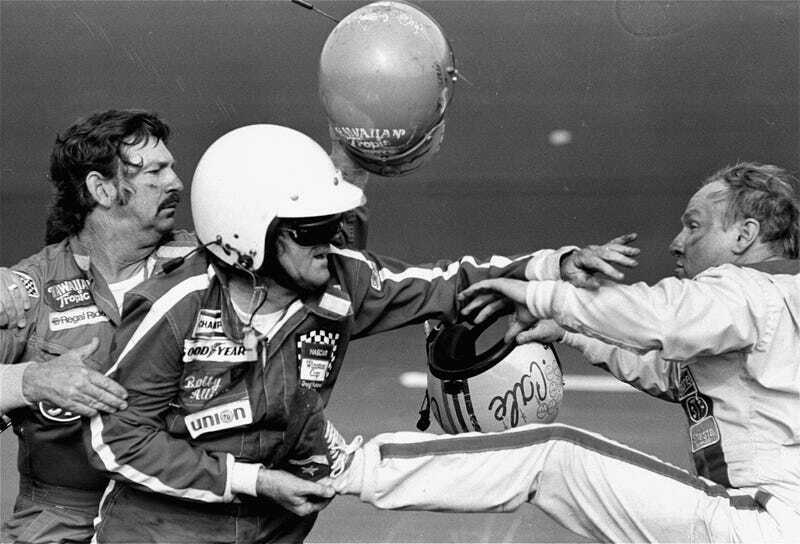 In this essay, I examine whether NASCAR's safety enhancements actually cause competitors to behave more recklessly. As driver-safety improves by 10%, competitors' recklessness increases by as much as 3.8%. More concretely, NASCAR's combination of the HANS device, SAFER barrier, and Car of Tomorrow results in a 3.6% growth in wrecked vehicles. Cup Series experience also influences the number of accidents in an event. A Cup field with average experience (7.2 seasons per driver) would reduce its number of wrecks by 10.3% if the entire field gained an extra year of starts. This partially explain the steady decrease of wrecks in NASCAR's top series over the past 7 seasons. Increased speeds positively influence reckless behavior as well. As the average pace of a Cup field (160mph) accelerates another 10mph, one expects the number of accidents to increase by 15.8%. Conceptually, drivers have less time to react to trouble ahead when events unfold quicker. Other characteristics held equal, road courses and restrictor plate facilities are responsible for more carnage than other configurations. After accounting for the slow pace and long courses, Sonoma and Watkins Glen are the most reckless tracks — almost double the number of damaged vehicles compared to non-restrictor-plate ovals, ceteris paribus. Race-level characteristics in the Cup Series from 1994 through 2013 are utilized for this study. I exclude races that did not meet or exceed their scheduled distances; ad hoc reduction of an event's distance may bias driver aggressiveness. I assign each race's pole-winning speed as the speed for the race since the average pace for an event is normally skewed by caution flag periods and pit-stops. For races that did not hold a qualifying session, I use the track's previous event's pole speed. I multiply the speed by 3.5% for restrictor-plate events in order to account for drafting effects that are present in races but not in qualifying. After these minor alterations, my cleaned dataset includes 662 NASCAR races. "We'll race like this until we kill somebody." — Carl Edwards, 2009. While other characteristics significantly impact the number of damaged vehicles in a race, driver safety maintains its strong and positive effect on recklessness. Specifically, an environment that is 10% safer results in 2.5% extra carnage (or as much as 3.8%). An alternative model that gauges safety with the HANS device, SAFER barrier, and Car of Tomorrow reports that the 3 structures collectively lead to a 3.6% increase in reckless behavior (consistent with a report from 2010). Other factors analyzed include field experience, speed of the race, the number of drivers competing, and fixed effects for tracks. As competitors earn more Cup-level exposure, they presumably advance their skills. The actual speed of race-cars lends to a greater number of accidents. Driving at higher speeds makes it more difficult to react to trouble ahead on the track. Driver density influences accidents, too. Assuming a field of 43 machines, cutting the track size in half nearly doubles the number of cars in accidents, ceteris paribus. Road courses are an anomaly. When controlling for their lengthy perimeters and relatively slow speeds, Sonoma and Watkins Glen result in the greatest number of trashed cars. I also considered several characteristics which demonstrated no tangible impact on the number of cars in accidents. The size of an event's purse, Chase races, the number of lead changes, the number of tire providers, and NASCAR's short-lived "5 and 5 rule" carried no significant effects on recklessness. My reported values are consistent across a handful of various measurements. I confidently submit that the Peltzman Effect, indeed, exists in NASCAR's top national series. Drivers take full advantage of a safer environment and choose to behave more aggressively. Specifically, as driver safety improves by 10%, their recklessness (no matter the measurement) increases somewhere between 1% to 5%. Discretely, the HANS device, SAFER barrier, and Car of Tomorrow have resulted in an uptick in accidents by 2% to 5%. So why is this important? NASCAR has successfully added safer elements to motorsports that instill confidence into its competitors. Because wrecks demonstrate a positive effect on television ratings and attendance, fans indirectly appreciate a safer atmosphere, too. Potentially dire negative externalities are present, however. As enhanced safety continues to take hold, more wrecks should occur — and the opportunity increases for a car to indavertently find a non-absorbent wall or a mangy catch-fence. Here are some questions for which I've no answer yet (i.e., chime-in and let me know what you think). Will NASCAR's baseline concussion testing lead to more missed races, perhaps shedding light that too many drivers were "playing hurt" recently? Will the Cup Series' new policy which mandates a driver race weekly (barring a medical waiver) pressure drivers to compete no matter their injury? Has the Chase — a mechanism which elevates several drivers into championship contention — stressed drivers on mid-level race teams to compete every week in order to maintain their outside shot at the title? That's it! Let me know if you have any questions, comments, or critiques. Contact me via electronic mail at andrew@nascarnomics.com or on Twitter at @NASCARnomics. Enjoy Speedweeks! Andrew Maness dabbles in economic research for a financial firm in Charlotte, NC. He incorporates his passion for motorsports with his quantitative expertise at NASCARnomics.com. Maness intends to build a career within auto racing as a research and analytical consultant.